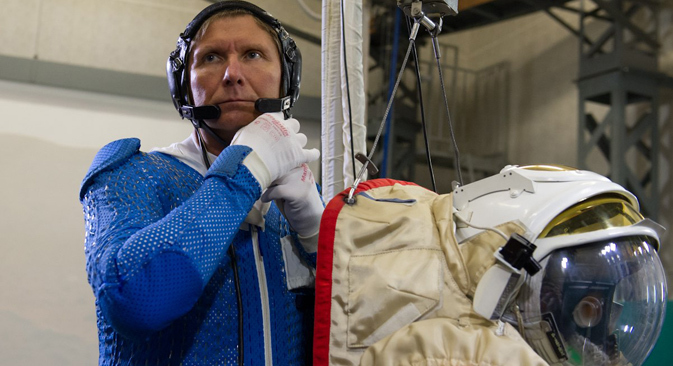 Gennady Padalka, who recently returned from the International Space Station (ISS), took part in the Sozvezsiye-5 experiment to study the effects of long-distant space flight on humans, as well as on the surfaces of Mars and the Moon. Gennady Padalka, the world record holder for the longest stay in space (878 days), participated in a simulated journey from the Earth to another planet. This was done in the framework of the Sozvezdiye-5 study, which began in 2013. Padalka returned to Earth on September 12 after staying at the ISS for six months, and began the experiment three days later. "The experiment intends to study the effects of a long stay in zero gravity, as well as a human's readiness to continue work in such conditions," said Oleg Voloshin, press secretary of the Institute of Medical-Biological Problems. "Today, when astronauts return to Earth in capsules they don't do anything by themselves. They are carried out, examined and are taken to medical facilities. The astronauts will face different conditions when they reach other planets. Therefore, it is necessary to understand whether they'll be able to do anything after landing on another planet." The experiment was carried out in the TsF-7 Centrifuge, and it showed that a long stay in zero gravity did not impact Padalka's operational skills or his ability to fly the ship. Eight Russian astronauts already participated in Sozvezsiye-5. The experiment is conducted by the Center for Astronaut Preparation and the Institute of Medical-Biological Problems. Sozvezdiye-5 is divided into two stages: simulation in the centrifuge, and work on the planet's surface. Apart from the Sozvezsiye-5 experiment, Russian scientists together with their American colleagues test each astronaut immediately after landing. With the help of sensors they measure the astronaut's ability to perform routine activities such as sitting, standing, and walking with their eyes closed.